C'est très beau avec ces arbres de différents verts. A sight for sore eyes, Bill - we have got through another winter! Bill Phillips: And it is bright and sunny this morning too. Weeping Willow is emoting nicely, Bill. Oh, I love the weeping willow. From my kitchen window I can see a similar willow in its spring dress. You've captured one of my favorite spring-time trees, Bill: the weeping willow! Look at her...poetry in action! This is such a wonderful place and I know for sure that Helen often visits this place with the children. Bill Phillips: They are fortunate to have it just around the corner! The willow makes my heart sing. Philine showed one yesterday. I like the well contrasted colours. 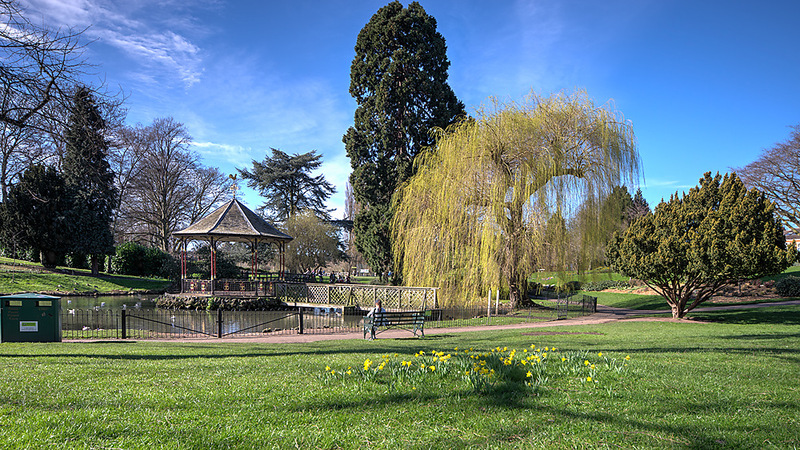 It looks to eb a very fine park, I note it is in Worcester, a place we've only visited briefly on two occasions. Bill Phillips: Very close to where Helen lives Brian. Spring is sprung, a lovely image Bill. Bill Phillips: It has been very spring like today Anne. Sadly I was not able to get out with the camera and enjoy it! Suddenly everything si starting to green up. Amazing what some warmth and some sunshine will do.